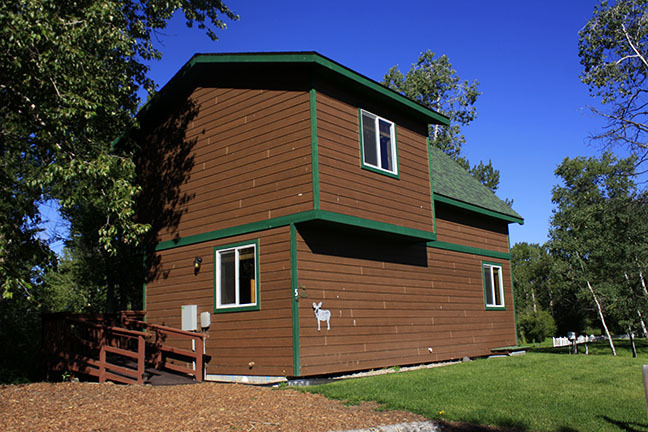 Our two story Moose Tracks cabin is located on Gallatin Creek next to our Creekside Cabins and is the perfect partner to it's neighbor, Bear Paw. A plush king size bed upstairs and 2 full size bunk beds downstairs, Moose Tracks sleeps 6. It has a full kitchen with a small electric range, oversize deck facing the creek, full bathroom with shower. Nightly cabin rental available mid May- September. Long term winter rental available early October-April. Sleeps 6 guests. King bed upstairs and 2 full size bunkbeds downstairs.